seawapa.co: What Would An Eruption Of The Yellowstone Supervolcano Look Like? On March 30, 2014, the worst earthquake in about 30 years rattled the Yellowstone supervolcano. Overall, there have been at least 25 significant earthquakes at Yellowstone National Park since Thursday, but it is the 4.8 earthquake that has many observers extremely worried. Could such a large earthquake be a sign that the Yellowstone supervolcano is starting to roar to life after all this time? And if it does erupt, what would that mean for the rest of the country? As you will see below, a full-blown eruption at Yellowstone would be absolutely catastrophic. It is estimated that such an eruption could dump a 10 foot deep layer of volcanic ash up to 1,000 miles away and render much of the nation uninhabitable for years to come. In essence, it would instantly bring the United States and Canada to its knees. It is true that it is normal for Yellowstone to experience up to 3,000 earthquakes a year. But most of those earthquakes are extremely small and nothing to worry about. But the 4.8 earthquake that struck on Sunday is definitely raising eyebrows – especially considering what else has been going on at Yellowstone lately. I don’t know about you, but the fact that the largest volcano in the U.S. by far has been experiencing “ground uplift” is not very comforting to me. Late last year a new study into the enormous super volcano found the underground magma chamber to be 2.5 times larger than previously thought — a cavern spanning some 90km by 30km and capable of holding 300 billion cubic kilometres of molten rock. If the sleeping giant were to wake, the outflow of lava, ash and smoke would devastate the United States and affect the entire world. Yellowstone lies over a hotspot where light, hot, molten mantle rock rises toward the surface. While the Yellowstone hotspot is now under the Yellowstone Plateau, it previously helped create the eastern Snake River Plain (to the west of Yellowstone) through a series of huge volcanic eruptions. The hotspot appears to move across terrain in the east-northeast direction, but in fact the hotspot is much deeper than terrain and remains stationary while the North American Plate moves west-southwest over it. Over the past 18 million years or so, this hotspot has generated a succession of violent eruptions and less violent floods of basaltic lava. Together these eruptions have helped create the eastern part of the Snake River Plain from a once-mountainous region. At least a dozen of these eruptions were so massive that they are classified as super-eruptions. Volcanic eruptions sometimes empty their stores of magma so swiftly that they cause the overlying land to collapse into the emptied magma chamber, forming a geographic depression called a caldera. Calderas formed from explosive super-eruptions can be as wide and deep as mid- to large-sized lakes and can be responsible for destroying broad swaths of mountain ranges. The oldest identified caldera remnant straddles the border near McDermitt, Nevada-Oregon, although there are volcaniclastic piles and arcuate faults that define caldera complexes more than 60 km (37 mi) in diameter in the Carmacks Group of southwest-central Yukon, Canada, which is interpreted to have formed 70 million years ago by the Yellowstone hotspot. Progressively younger caldera remnants, most grouped in several overlapping volcanic fields, extend from the Nevada-Oregon border through the eastern Snake River Plain and terminate in the Yellowstone Plateau. One such caldera, the Bruneau-Jarbidge caldera in southern Idaho, was formed between 10 and 12 million years ago, and the event dropped ash to a depth of one foot (30 cm) 1,000 miles (1,600 km) away in northeastern Nebraska and killed large herds of rhinoceros, camel, and other animals at Ashfall Fossil Beds State Historical Park. Within the past 17 million years, 142 or more caldera-forming eruptions have occurred from the Yellowstone hotspot. A full-scale eruption of Yellowstone could be up to 1,000 time more powerful than the eruption of Mount St. Helens in 1980. The next eruption of Yellowstone seems to be getting closer with each passing year. Since 2004, some areas of Yellowstone National Park have risen by as much as 10 inches. There are approximately 3,000 earthquakes in the Yellowstone area every single year. In the event of a full-scale eruption of Yellowstone, virtually the entire northwest United States will be completely destroyed. 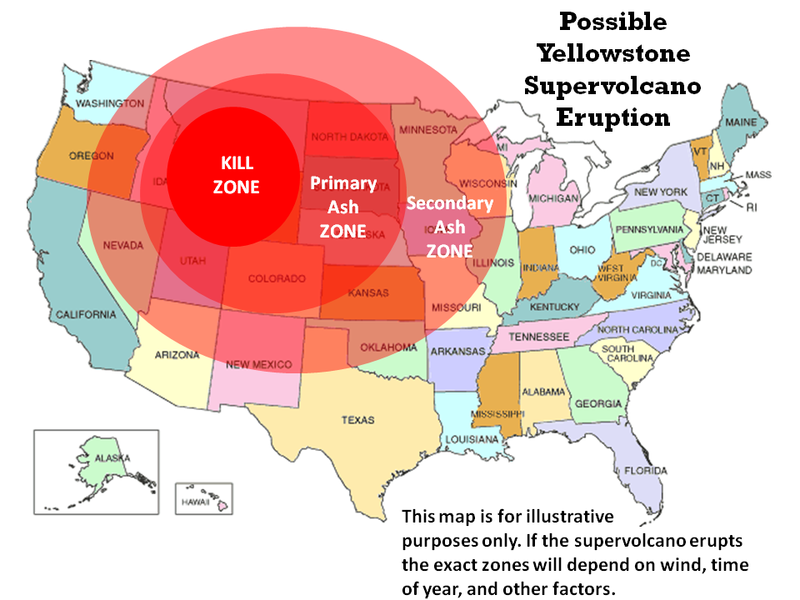 A massive eruption of Yellowstone would mean that just about everything within a 100 mile radius of Yellowstone would be immediately killed. A full-scale eruption of Yellowstone could also potentially dump a layer of volcanic ash that is at least 10 feet deep up to 1,000 miles away. 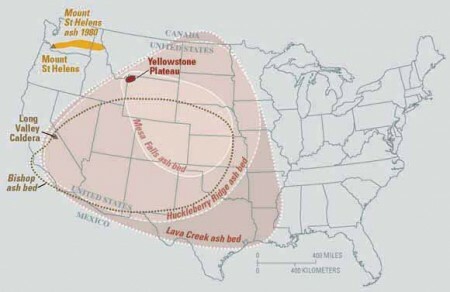 A full-scale eruption of Yellowstone would cover virtually the entire midwest United States with volcanic ash. Food production in America would be almost totally wiped out. The “volcanic winter” that a massive Yellowstone eruption would cause would radically cool the planet. Some scientists believe that global temperatures would decline by up to 20 degrees. America would never be the same again after a massive Yellowstone eruption. Some scientists believe that a full eruption by Yellowstone would render two-thirds of the United States completely uninhabitable. Scientists tell us that it is not a matter of “if” Yellowstone will erupt but rather “when” the next inevitable eruption will take place. In essence, a Yellowstone eruption would be on the same level as a Carrington event. Either one would fundamentally change life in the United States in a single day. Personally, I certainly hope that we do not see an eruption at Yellowstone any time soon. And actually, I am much more concerned about the possibility of an eruption at other volcanoes in the northwest such as Mt. Hood and Mt. Rainier. But if the ground keeps rising rapidly at Yellowstone and earthquakes like the one that struck on Sunday keep on happening, then it would be very foolish for us to ignore the warning signs. And of course you shouldn’t expect the government to warn you about the potential threat of a Yellowstone eruption until the very last moment. Generally speaking, the government is much more concerned about “keeping people calm” than it is about telling us the truth. We seem to have moved into a time of increased seismic activity all over North and South America. "We are on the verge of a global transformation. All we need is the right major crisis and the nations will accept the New World Order." - David Rockefeller speaking at a UN Business Conference, Sept 14, 1994. One of that major crisis is the Yellowstone volcanic explosion. That’s according to the South African news website Praag, which said that the African National Congress was offered $10 billion a year for 10 years if it would build temporary housing for Americans in case of an eruption. “South Africa will not be part of the plan, because there is a risk that millions of white Americans could be sent to South Africa in an emergency situation and that this would pose a risk to black national culture identity,” Dr. Siph Matwetwe, spokesman for the Department of Foreign Affairs, is quoted as saying. The gigantic volcano in Yellowstone has erupted three times over the last two million years, covering a huge area of surrounding land. Maps from educational institutions and government officials project that up to 17 states could be fully or partially impacted if the volcano erupted again. The far south of Canada could also get hit, as well as the far north of Mexico. Scientists aren’t sure when it will erupt next, although many have sought to assure the public that it probably won’t for a while. In reality, the volcano could erupt at any time, though officials would in theory be able to detect an impending eruption and alert Americans to the threat. And SEAWAPA should be an additional project to NAWAPA in order to continue Human progresses during this natural disaster event to continue food supply, technology development and Human progress.